A Ford Being Filmed for Fred Jones Ford of Oklahoma City? 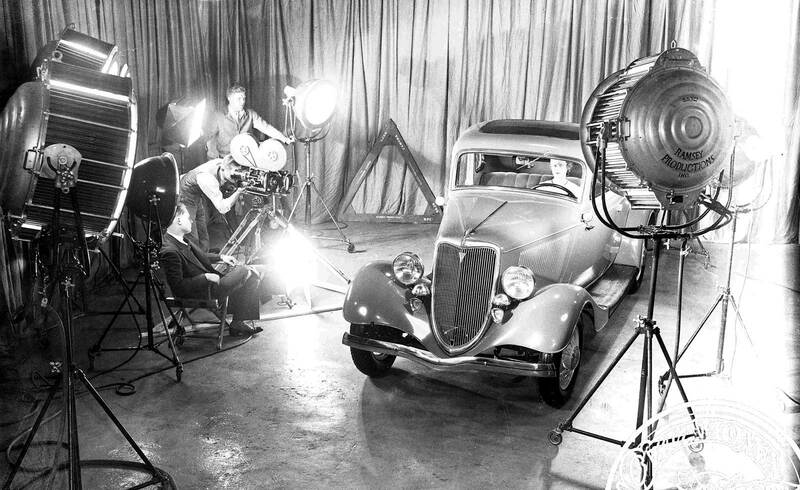 Today’s lead image contains a 1934 Ford five-window coupe and a model being filmed by Ramsey Productions of Oklahoma City, OK.
Research covering the Production Company resulted in finding that Arthur Ramsey of Oklahoma City was a filmmaker, who produced newsreel movies in the 1930s and later was a captain of the Combat Film Office during WWII. He appears to be seated in the director’s chair in this picture. A minute-long video (below) documents his career. The reason why Ramsey was filming the Ford in the expandable photo (below) might have been to produce a short film clip advertisement shown in Oklahoma movie houses for the Fred Jones Ford Company in Oklahoma City? Jones was active as a Ford dealer from 1926 as late as the 1960s and operated one of the leading Ford dealerships in the world. The successful businessman also formed the Fred Jones Manufacturing Company that went on to become the world’s largest authorized Ford engine and parts rebuilder, the operation is still active today. Share with us what you find of interest in the photos courtesy of the Oklahoma Historical Society. 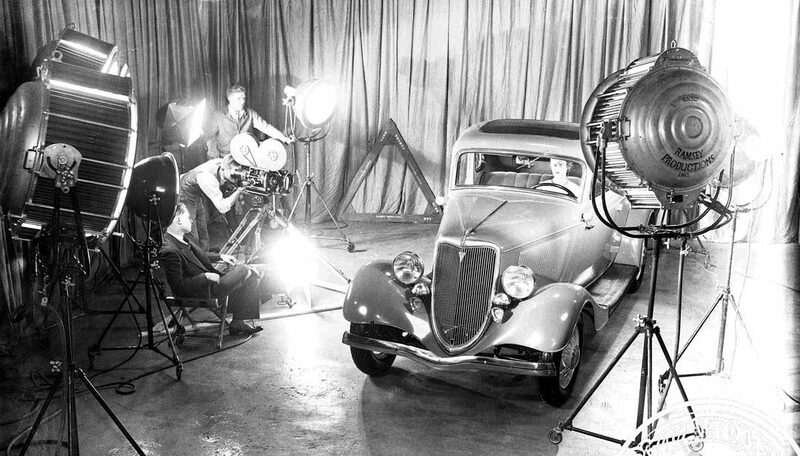 Ramsey Productions of Oklahoma City filming a 1934 Ford five-window coupe. One of Fred Jones’ used car lots in Oklahoma City, his Ford businesses at its peak covered six square blocks in the City – Below a short video about film maker Arthur Ramsey. This entry was posted in Uncategorized and tagged 1934 Ford, Arthur Ramsey Oklahoma City, Combat Film Office, Fred Jones Ford Company, Fred Jones Manufacturing Company, Ramsey Productions. !930s Fords were well worthy of being filmed, except for 1938, maybe. They were beauty queens that set a styling trend for the decade. Over the years I proudly owned one or more of each. We are told they were influenced by Edsel Ford who also designed the 1940 Lincoln Continental. Although I’m a devoted admirer of Edsel Ford, Bob Gregorie was the designer of the Continental. Edsel had plenty of input as the first one was built as a personal car for Edsel. It was only later they decided to put the Continental into production. Between the two Fords at the corner, under the “A” in CARS is a taller (so likely pre-1930) 4-door sedan with a broad contrasting accent panel beneath the windows with the door handles mid-way top to bottom in that panel. It could be a ’27 or ’28 Oakland or Pontiac…then again it could be a the same years in a Chrysler, except that its two-bar bumpers were slightly pinched at the ends. It also could be a ’27 or ’28 REO with its more radical cutout on the inward side of the fender, as seen to the left side of the Ford at the corner. The 1934 Ford was a beautiful car and highly prized today. It was the last year for Ford’s front suicide doors, with the hinges mounted on the B pillar instead of the front cowl. In the lead image it looks like the passenger side door was removed to give the camera a better view of the car’s interior but I wonder why they would take motion pictures of a stationary car in a studio? Did that car have some new interior or operating feature that could best be demonstrated with a movie? If they are ads to me shown in a movie theater it makes sense to put all the shots(I assume there will be more) on film. They’re also using some serious lights, probably because the film was so slow, even black-and-white. Yes, those two in the foreground look to be the size of “tenners” (10,000 watts) at least in era of my experience. Back then, possibly those could only make 5K. In any case, they put out heat just as you might expect. A pair of gloves was useful . What was required for the film stock then was something approximately as bright as daylight outdoors. While those don’t look like MRs to me, some interesting pix and history can be found on the Mole Richardson web site in the History section. The triangle at the back wall is used as the one under the camera tripod is, to keep the legs from splaying out any futrther when used at a low angle. There are some older vehicles to the far right under the R&G sign. One with visors over the headlights and the last one looks to be the oldest; I can’t identify them. The one in the middle could be a 1934-35 Buick. I like the prominent V8 logos on the posts and I believe there is a Great Northern boxcar way in the back on the left. Indeed, the 1933-34 Fords were probably the best styled Fords of the 1930s. The stock versions are even more prized today because so many were made into hot rods. The truck in the 2nd pic looks like a new Ford BB with a very unusual anti-theft device. Note s woman is behind the wheel, so perhaps they were doing a close-up stressing how easy it was to steer or shift or perhaps pointing out a new feature. A shot could then be edited into a scene of the car travelling down a riad. Arthur Ramsey was the son of prominent Oklahoma oilman, W.R. Ramsey, who built the 33 story Ramsey Tower (now City Place) in downtown Oklahoma City. I hope they gave her some sunscreen with those giant heat lamps. Fred Jones Ford was an active Ford dealer way past the late 60s as the article states; Fred Jones dealerships were around until the 90s when Ford did that trying to buy all the stores thing. 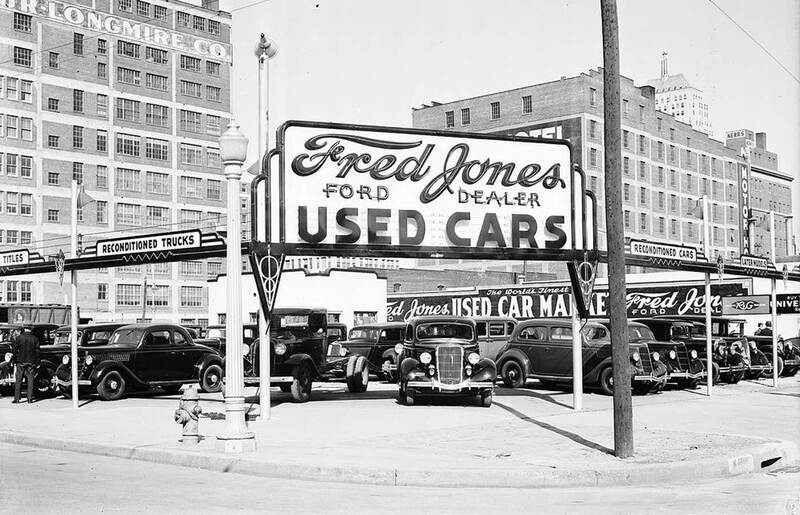 Fred Jones had both Ford, Mercury, Lincoln and Ford truck dealerships, and still maintains the huge rebuilder center. Mr Jones also had an interest in an early radio station in Tulsa , as well as a few other ventures.